Every month we are proud to host the Know Your Car Night Event for all new Toyota owners, and potential Toyota owners alike! We bring together our best service advisers, and factory trained technicians to show you everything you need to know about getting the most out of your new Toyota or Scion vehicle. The Know Your Car Night Event takes place on the 3rd Thursday of every month. Registration begins at 6PM and the event starts at 6:30 PM. The evening runs for approximately 2 hours. Beverages and Hors d'oeuvres will be served during the session and guests will receive a complimentary gift per family. It's a terrific opportunity to learn everything you ever need to know about your new Toyota vehicle. Plus! Get a behind the scenes look at our Service Department, where we will review the importance of vehicle maintenance and will be on hand to answer any questions you may have with regard to your own vehicle. If you are interested, and would like more information about attending the event. 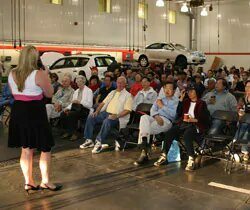 The night begins with a catered discussion where we explain the benefits, and answer and questions regarding Toyota's Extra Care Protection (ECP) Program, as well as Rust Protection. Our presenters will also go over specifics with your Toyota Road Side Assistance, Maintenance Schedules and Warranty Coverage on your vehicle, and answer any, and all of the questions you may have. 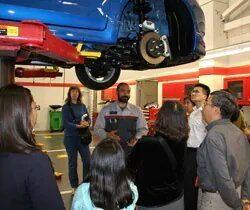 Afterward, guests will be invited into the shop where our top technicians will teach you the basics about vehicle maintenance and repair. The technicians will go over things like, how to change your oil, how to check your filters, how to change a tire, when to change breaks, and much more. There are always a collection of our top selling vehicles available for demonstrations, and if your vehicle is unique a technician will have a one on one with you and your vehicle to answer and additional questions you may have. Don Valley North Toyota's Service Advantage Plus is a commitment to providing an exceptional service experience. Not only do we offer competitive pricing, we also offer a long list of customer conveniences that will enhance your ownership experience. The advantage is that we service your vehicle the way we built it. Who is better qualified to service your Toyota than a Toyota factory trained technician? What better parts to use in your vehicle than Toyota Genuine Parts?